For timeless style, check out Bellacor's inspiring selection of decorative and enduring wall clocks. If you're looking for a hanging clock, fancy clock or just browsing wall clocks in general, we carry a massive selection of quality timepieces. Pass the time in transitional style with imaginative and inspired designs, like the gear clock pictured below. This striking timepiece features weathered clock parts and inventive, oversized gears and wheels that pay homage to the inner workings of these mechanical wonders. 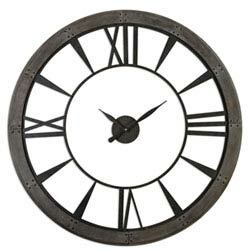 Go modern and try an elaborate wall clock with unique 3D metal designs in a rich, hand-painted finishes, Roman numeral lettering, and crème-colored vintage-inspired dials. Find contemporary charm with artful clocks, rich with geometric shapes and bold details. Or try your hand with industrial leanings found in large numbers, distressed finishes and generally metallic and industrial color tones. 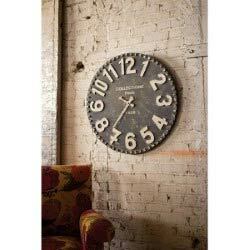 Clocks are a functional decorative element that is a great addition to wall decor. An old world style and elegant clock with a large face and ornate details is perfect for classical and traditionally styled homes. A more utilitarian or industrial style clock will fit right in with contemporary or modern designed homes. Retro designs, colorful frames, and pop art-like details are perfect for a more whimsical interior. Or if your style is more eclectic, nearly any clock style will work for your decor and can present a design opportunity for a standout part of your home. Your style evolves with Bellacor clocks! For style ahead of its time, choose from our wide selection of desk clocks and luxury clocks. Bellacor's finely crafted metal table clocks commonly feature fun, Paris-inspired aesthetics, with stately silhouettes and enriching forms. Retro desk clocks are another strong style choice with oval, crème color dials, beaded detail edges and distressed brown finishes to start. Plus, find a wide assortment of charming decorative accent clocks that are perfect for desks, guest baths or bedside tables. 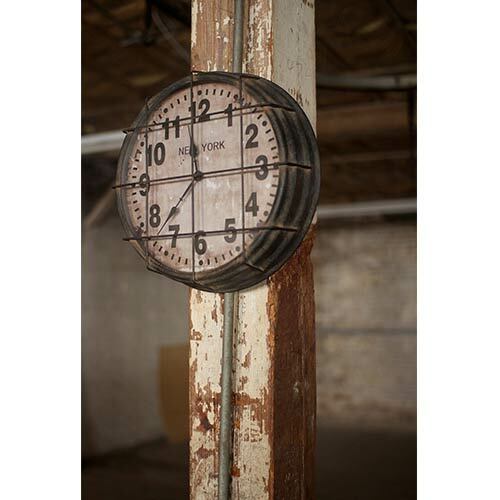 A vintage-look metal timepiece will add flair to most any room in your home as well! One of the first things to look for is the numbering on a clock: Do you want roman numerals or traditional numbers? Often that will dictate both how you read the time and the style of clock you choose. Many people love an ornate clock, with working cogs, oversized pocket watch styles, and filigreed details. Others live for the “unique” and search out funky clocks for their homes; these might have unique materials, high-chroma colors, or a sculptural feel to the clock. You want to find a clock that will match your personal taste and work well in your room. Wall clocks, particularly analog clocks, are best placed in the public spaces of your home. Typically a kitchen, dining room, living room, home office, or hallway are strong places for wall clocks. Because they are both decorative and functional, many clock styles can be incorporated into a wall of artwork or photos easily. If you are bringing unique clocks into your space, you might even want to use the design and size to create a focal point in your room. Try centering it amid smaller wall decor or let it stand alone on a wall for emphasis! You can always add timeless personality to any room in your home with Bellacor's vast selection of oversized clocks and fancy wall clocks. If you're looking for a timekeeper with bold, contemporary style look no further than Bellacor's oversized wall clocks. 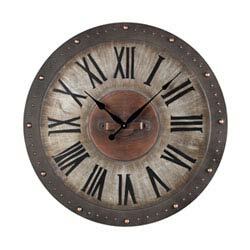 Find artful hanging wall clocks with open work styling, Roman numeral lettering and a rustic black finishes to add visual impact to your at-home retreat. Large, eye-catching dials make our chic metal timepieces easy to read from across the room. 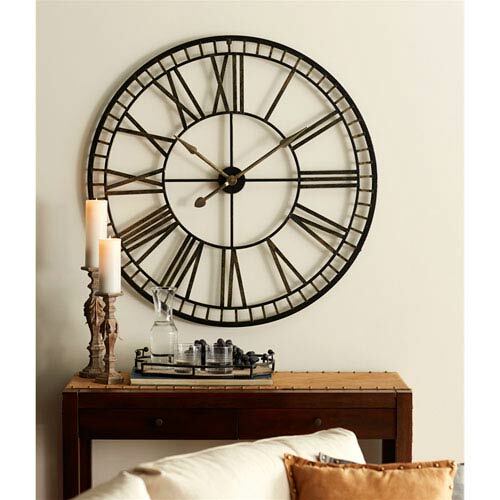 Add enduring style to your living area, den or family room with our vast selection of extra large decorative wall clocks. If you're looking for a timepiece on the compact side, Bellacor's curated selection of small wall clocks will add distinctive flair to your guest room, bath or any room in your home. Add a cabin style clock to your den with Bellacor's rustic lodge designs. With pastoral, outdoorsy timepieces, you'll often find unique resin deer antler styling, animal motifs and more. Rugged and nature-inspired, small wall clocks like the one pictured below will provide an easy-to-read, analog dials that mount easily to a wall. While Bellacor's small clocks may be petite, they're guaranteed to be bold on style. If you're looking for a small wall clock or a fancy clock for a small space, look no further than Bellacor! ★ ★ ★ ★ ★ 4 out of 5 (151 reviews). Beautiful clock. Looks better in person. Very sturdy. Just lovely. I bought this clock because of the style. I was very disappointed by a couple of things. First of all, it took 5 weeks for the shipping which today is unheard of. Secondly, the quality of the paint and construction is very poor. I expected the clock to have an aged vintage look, but i did not expect for there to be large white paint drips running down the numbers onto the black background. I ended up keeping it and touching up the paint myself because I didn't want to go through the hastle of shipping it back and looking for a different clock. Was surprised how flimsy this is. Installed battery but having a hard time with the minute and hour hand. Still trying to adjust. Not happy with product. This clock is an absolute showstopper! I have been looking for a giant clock for quite some time, and am so glad I found this one! I am complimented on it from every guest in my home. Assembly is quite simple. I was thoroughly impressed with how quickly it was shipped as well! Great product, excellent company!